When a Tunisian street vendor, Mohamed Bouazizi, lit himself on fire in front of a government building in Tunisia in December 2010, a wave of protests and upheavals spread across North Africa and the Middle East. Pointedly referred to as the Jasmine Revolution or the Arab Spring, the tragic events in the Muslim world and the ensuing Syrian civil war highlighted two things: the complexity of the African continent and the Middle East; and how our ethnocentric, western, northern and Judeo-Christian worldview needs to be revamped and revised to fully grasp our changing global reality. For more than 70 years, the NATO Alliance has tackled conventional problems with overwhelming military might, pursuant to the mantra that "one size fits all.” The Alliance defaulted to its “NATO-centric” mentality to enforce the 1973 United Nations resolution that called for protecting civilians and enforcing an arms embargo in Libya in 2011. During the operation, the Secretary General of NATO said, “The alliance’s work was able ‘to support the United Nations Security Council and help implement its decisions that add to the credibility of the UN.’” While NATO viewed its actions in Libya favorably, they did not take into account one glaring and important aspect: NATO’s perception by Africa. A study done by the NATO Defense College in 2013 revealed that the Libya operation’s strategic objectives were perceived as a shift from civilian protection to regime change, and blatantly relied on brute military force. Additionally, NATO’s intervention demonstrated a lack of flexibility to afford the African Union ample time or opportunity to push for a negotiated settlement. What are the issues and perceptions that prevent us from developing an attitude of “us and them” instead of “us versus them”? This antagonistic relationship between distinct entities, elements or human beings emerges from our fears, uncertainties and, above all, our lack of understanding about one another. In essence, the Arab Spring and the Libya conflict brought to light NATO's inability to clearly interpret the nuances of the Arab world, specifically in the realm of the individual norms, customs and behaviors of each nation. The fallout of Libya, combined with the instability in North Africa and the ensuing Syrian refugee crisis, highlighted NATO’s conventional “ethnocentric approach” towards Africa and the Middle East. The shifting international landscape forced the Alliance to rethink its long-standing and successful Cold War-centric model and reorient its mindset in a more comprehensive way suited for today’s asymmetric challenges. The plurality and intricacy of the South can clearly be viewed in diagram 1 (below), where cultural, economic, and political activities interact in a convoluted space to harness and safeguard specific interests—in many cases unbeknownst to the central governments. The multi-dimensional nature of this region copiously demonstrates the need for more flexibility when analyzing its threats and ambiguities, while capitalizing on the array of opportunities that African and Middle Eastern regimes can offer in terms of stable and steady governance. The dynamic and precarious post-Arab Spring backdrop has necessitated the Alliance to collectively amend its perception of the factors that effectively constitute long-term regional stability in the South (the Middle East, North Africa, the Sahel, and Sub-Sahara). By establishing the NATO Strategic Direction-South Hub in September 2017, headquartered at Allied Joint Forces Command in Naples, Italy, the Alliance broke with tradition by establishing a new standard for a 29-nation military establishment. The overarching objective behind the Hub is to change NATO’s mindset on how civil and military organizations find common ground, how to seek and build upon capacity and capability-building initiatives, and how to bridge the gaps of mutual understanding that ultimately contribute to long-term stability and peace in NATO’s southern borders. The Hub is chartered to scope out new opportunities to develop and strengthen institutions by forging unique relationships with civilian stakeholders. Linking with these non-traditional NATO partners through collaborative information sharing to gain a more complete picture and in-depth understanding of the indicators of instability. Strong and enduring alliances with International and Non-Governmental Organizations will ultimately alter how NATO  currently manages and exchanges information, as well as how it builds and fuses networks of knowledge between civilian and military organizations—all in an open and unclassified environment. The Hub construct is revolutionary for a military organization like NATO, originally cultivated for deterrence in a bipolar Cold War world. It must now morph and strive to de-conflict and act in concert with security sector reform efforts, defense capacity building initiatives, and institution-building measures in the South. For that reason, the Hub is actively building relationships with United Nations agencies, as well as regional bodies like the European Union, the Economic Community of West African States, and the Gulf Cooperation Council. Admiral James G. Foggo III, U.S. Navy, is the Commander, Allied Joint Force Command Naples; Commander, U.S. Naval Forces Europe; and Commander, U.S. Naval Forces Africa. He is a 1981 graduate of the U.S. Naval Academy. 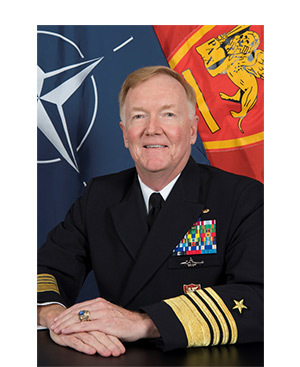 Admiral Foggo is also an Olmsted Scholar and Moreau Scholar, earning a Masters in Public Administration (MPA) at Harvard University and a Diplome d’Etudes Approfondies (DEA) in Defense and Strategic Studies from the University of Strasbourg, France.